The Sea Turtle Tour Fills up Fast! 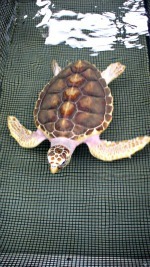 The sea turtle tour is here because of NOAA Fisheries Laboratory, Galveston. They provides scientific information on a variety of marine management issues. They work in management of shell fish and fin fish. And protect endangered species in the Gulf of Mexico. The turtles raised here are used to help in the design of netting technology. For example shrimp nets. These nets skim the sea floor. 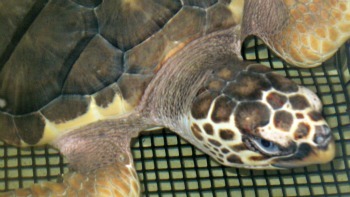 Turtles are eventually captured with other marine life. These older nets had no means for turtles to escape. That combined with the stress of capture often drowns the animal. 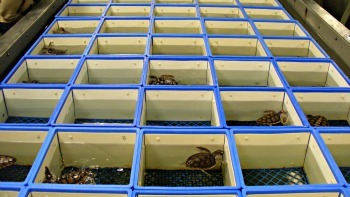 New nets enable turtles to escape without undue stress. Call ahead and reserve your place. The sea turtle tour is very popular. You have to call ahead and provide an email address. They will email you a form. Then provide the basic information. NOAA is located near the back of San Luis Resort Hotel. It sits behind and a little to the east. 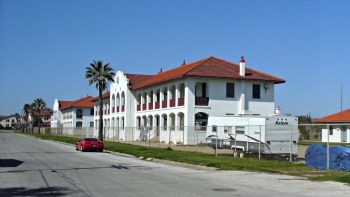 Arriving on Galveston, enter seawall Blvd., off 61 St. Street turn left. Continue about one mile. When you see Salsas Restaurant on the left, turn left. At Ave U turn left. It’s straight ahead. This is the buildings. Drive behind it. At the middle gate turn in and park. 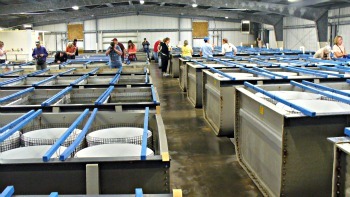 This facility rises Loggerhead Turtles. During the briefing information is exchanged. If you’re from outside the US you must present your passport. On our tour were people from everywhere; Canadian, New Yorkers, Pennsylvanians, Oklahoma, and Californians. We toured during the winter months. Summer will be even busier. 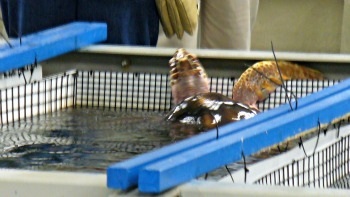 We learned there are five species of turtle in the Gulf: Kemps ridley, Green, Loggerhead, Hawksbill and Leather back. Some other cool facts; sea turtles can’t withdraw their head and legs like land turtles. Hum, I never would have thought about that. They have fins instead of webbed claws like land turtles. The leather back is the world’s largest. Growing to six feet in length and weighing up to two thousand pounds! I’d love to see that! But where do you put a two thousand pound turtle? Have camera lens cloth with you! The barn is hot and humid. My camera lenses keep fogging for several minutes. Your glasses do to. The turtles are one, two and three years old. In the barn you have about 20 to 30 minutes there. It's enough time. There is only so much to see. Besides their different sizes, they look the same. But one had some character! He wanted out of that container. He was a three year old. His/her picture is fuzzy but I had to include it. It looked like it was after her purse. The turtle tour is a fun hour. It's a privilege to see this marine life up close. There were no children on our sea turtle tour. But it has to be a hit with them. Leave the Sea Turtle Tour and return to Galveston Travel and Charm Homepage.